I haven’t written something vague in a while, so here goes. Something big is happening. We can’t say who it is, but we can tell you that a big (and I mean BIG!!) organisation contacted us looking to work with us in order to get information to arrest scammers. 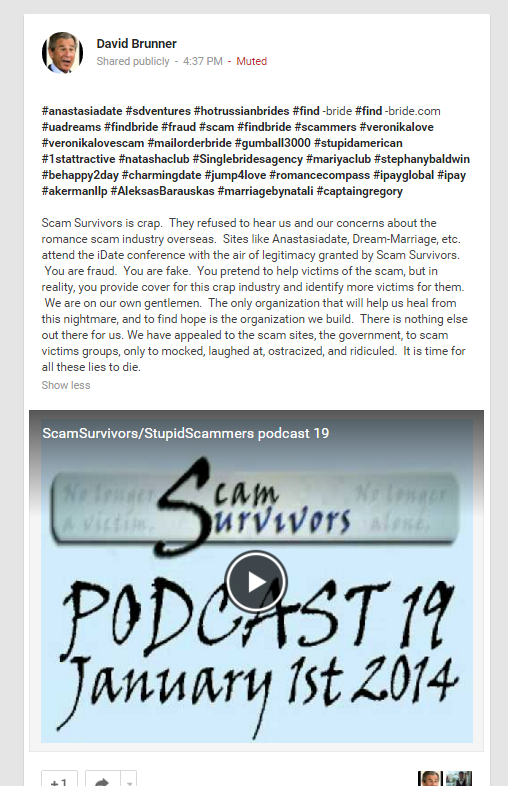 So far we’ve sent them the information of over 100 scammers that they’re now working on. And that’s just the start. This really is big news for both us and the antiscam community as a whole. Someone with the sway to get scammers arrested is using what we give them in order to try and do just that. How’s that for vague? Of course this is news to me, unless you count the pens I pick up at iDate on the displays. Do they count? So here’s what happened. Someone joined our site spouting all kinds of rubbish about various dating sites. Some investigation led us to the conclusion that he was either someone angry after being scammed, with an axe to grind with anyone related to dating sites and completely unwilling to listen to reason, or one site trying to badmouth others by creating a fake identity. Either way, we don’t care. That kind of person is not welcome on our site. They come back with several other accounts, which are all also banned. Next up they decide to start adding comments to our YouTube videos. They get removed. Today he decides to have another go. Here’s what’s been written today about us. Click on the image for a larger version. After it I’ll copy the reply I made. 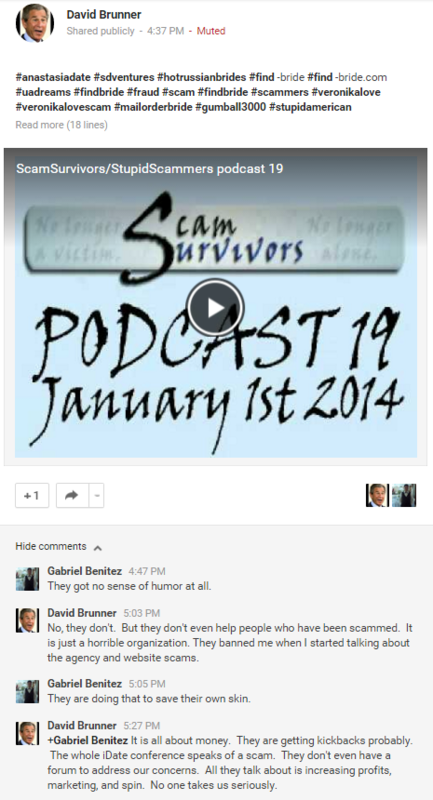 +David Brunner Seeing as you want to do this in a public forum, let’s go for it. We read your posts on our site. We read them and decided that your viewpoint is so “out there” that you’re not welcome on our site. We also saw your posts elsewhere where you were referring to the women on dating site profiles as “prostitutes”, which was the final straw for us. Your comments above pretty much prove our point. We pride ourselves in being independent of the dating site industry, even going as far as to refuse every offer of sponsorship so we can remain so. If there’s a scammer on a dating site, not only do we give the details of the scammer, but we name the site they were found on – no exceptions. We work with the authorities toward getting scammers arrested. We do all this for no money. Every person on the site is a volunteer. We get scammer bank accounts frozen, fake sites closed and their details exposed for the world to see. Again, we do this for free. 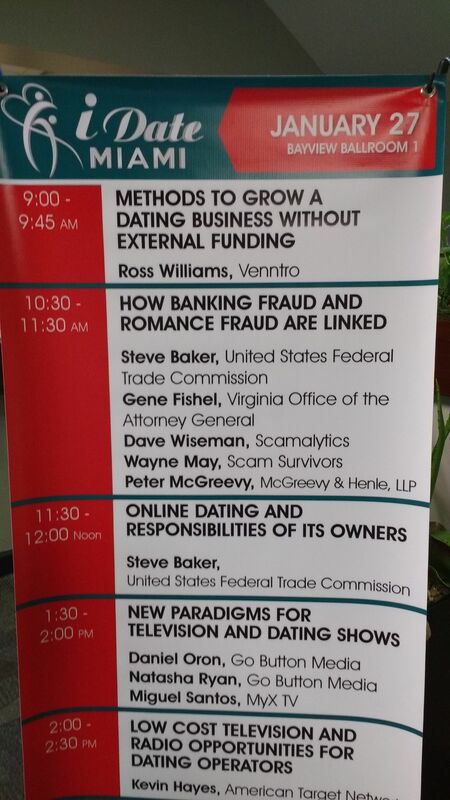 When at iDate, we give presentations on how to help keep the people on dating sites safer and aware of scammers. We’re not there to help the site owners, but to protect the people who go to their sites from being scammed. We also tell the site owners that if a scammer is found on their site, we will and do name them. That’s hardly winning us any popularity contests, but we do it anyway. Maybe you’d like to explain to me how our presence there can have such an influence that dating sites obtain legitimacy from it. I can only dream of such power. So now let’s jump back to your first sentence. 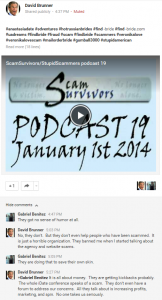 “Scam survivors is crap”. Really? Maybe you’d like to tell this to the tens of thousands of people we’ve helped. To the people we have had to talk to whilst they were holding a gun in their hand ready to end their own life. Am I exaggerating for effect here? Not one bit. What about the people who told us they had no one else they could talk to about their scam? The ones we have spent hours with talking them through what they need to do after being scammed or the ones we’ve helped retrieve their money before the scammer collected it and it was gone forever. Do they think we’re crap too? Of course not. You’re just angry that we wouldn’t give you a platform to spout your drivel. You are not welcome on our site and you never will be. Next up I find more comments made by him, and this is the one I really need to address. It’s worth pointing out why we don’t deal with sites, but rather individual scammers. We’re four people. There’s barely enough time in the day to do what we do already. It’s the same reason we don’t deal with “real life” scams, just online ones. So at this point we’re being accused of taking kickbacks. I don’t know whether to find that more insulting, or being accused of having no sense of humor. It’s a tough choice between the two, but the kickback thing slightly edges it. So let’s talk about the kickbacks thing shall we? No dating site EVER has given us a kickback. Once, on another site I was running at the time, I was offered a kickback if we changed the bad reviews of a dating site to something more positive. They were greeted with a less than polite “take your money and shove it where the sun don’t shine!” response from me which is documented in one of my books. 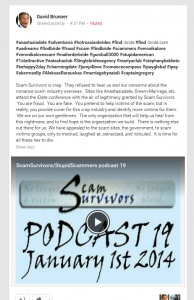 Even the threat of legal action they made later on to try to get us to change it didn’t make me bend, and the same stance holds firm on ScamSurvivors. We offer – as the site’s front page says – “Free, non judgmental help and advice for those scammed online”. Maybe I now need to add “independent and 100% kickback free”! 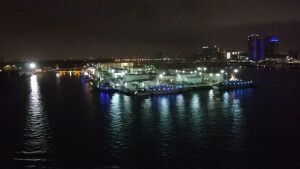 iDate Miami 2016 – Cruise time!! The day before the cruise, Mike, one of the people at the conference asked if I wanted to share a ride to the cruise. Big Al was picking me up in his big rental car, so there was plenty of room for the three of us. I booked out of my room and spent some time in the lobby waiting for my ride. At this point the rain was pretty bad. Big Al parked up and we went for lunch before meeting with Mike at the entrance to the hotel. The car was returned, we found a shuttle bus taking us to the cruise ship and before too long we were booked in and checking out our room. We’d opted for one with a balcony, and it was definitely the right choice. The room was smaller due to it, but still plenty big enough, plus we could sit outside and enjoy the view. Safety briefing over, we sat on the balcony and watched the ship set off. I’d never been on a cruise before, so this was an entirely new experience for me. It turned out to be pretty enjoyable. The ship is big enough that you never feel closed in and barely rocked so it almost felt like you were on land. The young lady who looked after our room knew our names right away, as did the one who served us food. The food was good too it has to be said. We bought our drinks by the bucket as they were cheaper that way, we could take them back to our room and drink them there, plus they filled the bucket with ice. The first evening a group of us got together for dinner and spent the entire time chatting. 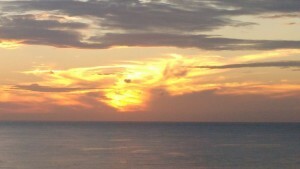 Our next day was to be at Key West, which was the one place I really wanted to visit. Key West was amazing. The people were so laid back there. First thing first, I needed to buy a hat to protect me from the sun. The first hat I tried fitted me perfectly, so that’s what I went for. The one place I wanted to visit was Peppers of Key West so I could stock up on hot pepper sauces. And oh boy, did I!! I left that place an hour later with 7 bottles, a burning tongue, numb lips and a big goofy smile on my face. Also a free bottle opener for trying their really hot sauce. After that, the 5 of us met up and went to the southernmost point of the USA. A few more presents bought on the way back and we went back to the boat to rest up before dinner. I had a call from catering asking if I could do them a favor. There was a wedding party who wanted to sit together. Would we be willing to move if they offered us an upgrade to a private table. Umm, yes? Free upgrade, like we’re going to turn that down! Before eating, we got to see the sun set. Pretty, isn’t it? There was another hot pepper sauce shop there too, but I skipped this one. Seven bottles was more than enough, plus I’d had to buy a bag just to fit the presents into. Luckily I was allowed a laptop bag and carry on for free on the flight back, so I didn’t have to pay any extra. Back in the ship, they had a sale on watches and I absolutely fell in love with this gorgeous pocket watch. I ummed and aahed and eventually decided not to get it, but regretted it afterward. Dinner, checked out a show and then back to the room to sleep. Day 3 was completely at sea, and we spent it just chilling. Walking around the ship, I saw the watch again and this time went for it. Now I’m really happy. More beers, more food and more chilling was pretty much the order of the day here. It was all pretty pleasant. What a view to end the holiday. Breakfast, check out, then to the airport and home. So would I do it again? Definitely. Would I do iDate again? Of course. In fact I’m already working on attending the one in London later this year. No 9 hour flight and 4.5 hour bus journey to get there this time. Plus it’ll be cooler. If you do attend London, look out for me there. I’m not hard to spot. Review and highlights of the iDate London 2015 conference. iDate 2016 Miami – Time to talk the talk. Before the session, we get together to work out what order we’ll speak in and what we’ll each discuss. I explained the different methods scammers use to abuse a person’s bank account as part of their scam. The audience seemed genuinely shocked at how it was done, and how easy it is. The talk went well, was very informative and lots of questions were asked by the audience after it. First question was directed at yours truly, which really pleased me when you look at the caliber of the speakers there. The hour we were allocated flew by. Next up was Steve Baker’s talk, and I definitely hung around for that one. That brought us to lunch, which was once again pretty damn tasty. The bulk of the afternoon was spent chatting to people, making new contacts and discussing ways we can work together. As you can imagine, the main area was pretty loud, but just around the corner was a quiet spot with a bench that was perfect to chat to people on. Now came the final panel. Packed room, a panel of many of the biggest names in the dating industry ready to answer any questions and free beer/snacks. What more can a person ask for? This was my 4th iDate, and every one has ended this same way. They went to town on the snacks this time round too, with freshly made pretzels. Once this was over, it was time to head back to the hotel. Well, it would have been if not for one thing. The bus broke down on the way. At this point I really have to give all the credit in the world to the driver who kept his cool and pulled over without us even realizing anything was wrong. The bus pulled up right behind another bus that had broken down, and most people assumed he’d stopped to help. It turned out that one of the hoses on the air brakes had come off. What could have been a disaster was handled in a calm and professional way with people ordering Uber rides to take them to their destinations. I heard afterwards that the bus company had reimbursed everyone’s costs for it, so no one was out of pocket. By the time we got back to the hotel, the rain had come in. I actually spent some time outside, just standing in it, enjoying the coolness it brought. That got me a few odd looks I can tell you! 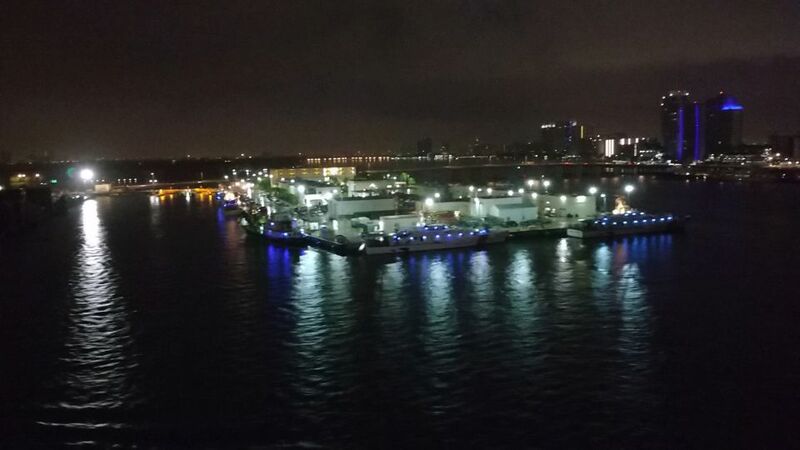 So, finally back at the hotel, I packed my suitcase up ready for the next part of the adventure – a cruise from Miami to Key West and Cozumel – and got an early night. 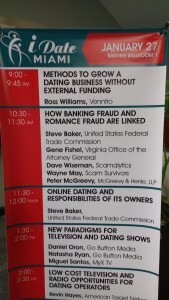 iDate 2016 Miami – Wayne wears a suit. Well I managed to get a couple of hours’ worth of sleep at least. Showered, dressed but not really refreshed, I took the time to nip across to the Walgreens across the road from the hotel to do a little present shopping before jumping on the shuttle to the conference with everyone else. It wasn’t even 9am yet, but it was HOT! The biggest thing I took away from the whole thing was just how hot it was the entire time. Remember, just a day before I was in the UK where temperatures were hovering around the 0 degree range. Hot weather and I do not get along. Anyway, the journey took about 20 minutes, and I got to check out the area as I went along. Miami is a really pretty place. It’s very colourful for sure. Lots of pastel colours everywhere. I’d only seen it on TV and read about it in books before, so it was a real experience. The conference center was huge. I didn’t even realize there was a room being used upstairs for a while. Most of the morning was spent talking to people about what we do. There’s always a “speed conferencing” session on the first morning, and that gave me a chance to speak to other people who likely wouldn’t usually have approached me. Imagine speed dating, but with company owners instead of people looking for love. Cards were exchanged, introductions made and lots of people were left confused by the fact we’re not about making money but helping people for free. This is a conference for the industry to exchange ideas on how to bring more people to your site and increase revenue. We’re there saying “nah, we’re all about giving out free advice” and it leaves them scratching their heads. Some people though did get it and commended us on what we do. If you ever do visit an iDate conference, then this session is definitely worth attending. After that, it was back to pressing flesh in the lobby until lunch. Lunch was amazing. Really really good. The weather was so bright that it was done outside. Too bright for me, not helped by the fact I’d left my glasses in the hotel room, so I took mine indoors and was joined by a few other people. Most people did enjoy their lunch outside, but it wasn’t for me. By this point I’d already made some pretty good new contacts and caught up with some people I’d met at previous events so the morning was very good for us. The afternoon was pretty much the same – shaking hands, exchanging details, discussing what we do and attending talks. This isn’t our first time, so we know how it goes. We were even offered a few suggestions on what to do to help increase our outreach that we hadn’t thought of before. That alone made it worth it and we’re looking to implement them in the very near future. Partway through the afternoon, Steve Baker from the Federal Trade Commision walked in, saw me and immediately came to chat with me. We’d originally met in Vegas the year before, and we’ve been exchanging emails ever since. He told me he’s retiring this year, and I really hope we can have the same kind of relationship with his successor. He’s also considering either writing a book or starting a blog. If he does, you can be sure we’ll be checking it out. Did I mention he’s a really nice guy? No? Well, he’s a really nice guy. So day 1 was over, and we all got back to the hotel to freshen up before the iDate awards which were being held in the hotel. This year I was presenting an award for best new technology. Time to put on that suit I own but practically never wear. Before the ceremony there was free drinks and finger food. 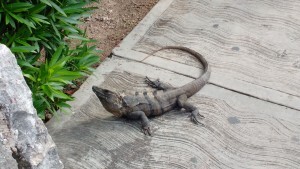 How can I put this politely – the food at the conference was much MUCH better. The meal itself during the awards was better, but still not brilliant. The ceremony itself though was a complete blast. I missed out on it last year, but I’m glad I attended it this year. There were also plenty of photo opportunities to be had. All in all, a good night, and our friend Svetlana Mucha won an award, so I’m really pleased with that. After the ceremony, I skipped the party and went back to my room to catch up on a few things before getting to bed. iDate 2016 Miami part 1 – First stop, London. I’ve just gotten back from iDate Miami, and it was a blast. Not only did I attend the conference, but I also attended this year’s iDate awards and also the cruise after. More on them later though. The conference was January 25th-27th with the cruise leaving on the 28th and arriving back on February 1st. Before any of this though, I had to go to London to do a TV interview. My original plan was to leave at around 1:30am on the 25th and get a bus direct to the airport, then fly out on the 9:00am flight. An email from a production company I’d recently spoken to changed that when they asked if I’d be willing to arrive a day earlier to do some filing with the promise they’d book me a hotel room for the night right by the airport. No big deal, so I agreed. With new plans, I set off at around 9:30am on the 24th, got to the bus station in plenty of time to catch my ride and settled in for the journey. It took about 4.5 hours before I arrived at Heathrow airport before jumping in a taxi to the airport in plenty of time to meet the interviewer and camera person. Unfortunately there was a snag. The room had been booked, but not paid for. I had very little UK currency on me as I’d changed it all to dollars ready for the trip. One call later, their office were trying to work out the issue and promised to call me right back. In all fairness, 10 minute later I had a call back and the issue was resolved. It turned out to have been a spelling mistake on the booking form. I was asked to wait a few minutes while this was fixed and had barely sat down when the reporter turned up. Introductions barely over, the lady from the desk came over with my room key and we jumped in the lift to the room. The room was fairly small. Perfectly adequate to sleep in for the night, but somewhat restrictive for doing a TV interview. What people must have thought as they saw me with 2 women and a whole bunch of camera equipment going into a hotel room I can only imagine. The beds were movable, so we pushed one one way and the other at a 90 degree angle to free up some space for filming. Filming itself was pretty standard, and followed the routine I’ve done many times before. Basically, they ask me questions, then ask for me to show the scam being done. After that, they ask the same questions and I repeat my answers, but this time being filmed from a different angle. A few close ups on my hand moving the mouse, typing and on the laptop screen itself as I scroll pages up and down finished the session and everything was done. They left and I went to get myself a beer before settling down for the night. I had to be up at 6am, so two alarms were set to be sure. The last thing I needed now was to oversleep and miss my flight. The shuttle buses to the airport didn’t start until 7am, so I took a walk to the bus depot and jumped on a bus to Heathrow. Actually, I had a slight detour as someone’s car broke down right in front of me as I was checking my satnav for directions to the bus depot and I helped try to jump start it. No luck unfortunately, so we pushed it off the road out of the way so that they could call a breakdown company. I arrived at Heathrow in plenty of time and settled down waiting for the flight. Netflix came to the rescue in keeping me occupied while I waited, the same way it kept me busy on the bus journey the day before. Finally my plane arrives, I board and just over 9 hours later we’re touching down in Miami where I’m greeted by Big Al. He’s flown down to pick me up, spend a few days visiting an old friend and then rejoin me on the cruise. We go off to the hire company’s building to collect the car he’s booked, get a free upgrade to a larger car and set off for the hotel. I’m staying at the Deauville beach resort, and the conference itself is at the Kovens conference center. Free buses have been laid on to take people to and from the conference, but I won’t be using them until the next day. BA parks the car while I book in. At this point I should really thank Marc Lesnick, the conference organizer. Not only has he given me a chance to speak at the conference, but he’s given me a free ticket to the awards ceremony and also paid my flight and hotel for the time I’m there. There’s no way I would have been able to attend otherwise. Remember, we’re not making any money from doing this, and he’s fully aware of that fact. The room itself is huge, almost twice the size of the room I’d spent the previous night in. It also has an amazing view of both the street outside and the beach. A number of people have complained about the rooms there, but I have to say I had no problems. I guess I was lucky – or more easily impressed. BA also gives me a present he’s been promising me – a 6 pack of Strongbow honey. We don’t have that in the UK yet, and after trying it, I’m desperately hoping it does turn up here sooner rather than later. The room has a fridge, so they get popped in there for later. We go off for something to eat before he sets off on his 3 hour drive. At this point I let my wife know I’m safely at the airport and get to bed, ready for the conference the next day. It’s only 8am, but my head is still on UK time, so for me it’s 1am and I’m ready to drop. I turn the AC up to full, and as soon as my head hits the pillow I’m asleep. Next time I’ll talk about the conference itself.